'This is clearly a book with great breadth and diversity… a valuable addition to the literature about east and southeast Asia.' T Forsyth, Development Studies Institute London School of Economics and Political Science, in Land Degradation and Development As their economies and populations expand, almost all Asian countries are experiencing profound ecological problems at the national, regional and global level; be it air pollution in rapidly growing cities, trans-boundary water pollution or climate change. While the countries of East and Southeast Asia are the victims of environmental change, they are also complicit in causing it at home and abroad. As these countries move towards international environmental cooperation, a central issue becomes the vital connection between foreign policy and environmental problems. Foreign policy is about pursuing and promoting national interests, however it is not always clear what a country's national interests are or ought to be, particularly with regard to complex international ecological issues. On top of this, it is almost always debatable how best to promote them. Confronting Environmental Change in East and Southeast Asia is a collection of concise, hard-hitting essays by a group of international experts and scholars that address these complex issues. The book takes foreign policy considerations into account in its analyses of how states and other actors in East and Southeast Asia confront environmental change through international cooperation and environmentally sustainable development. The first part of the book examines many of the actors, institutions and forces shaping environmental diplomacy and foreign policy in East Asia, with a focus on China and Japan. The second part of the book takes a deeper look at the relationships between ecological politics, international relations and environmentally sustainable development in East and Southeast Asia. Several chapters in the second part focus on how environmental foreign policies impact countries in the region as they endeavour to implement environmentally sustainable development. 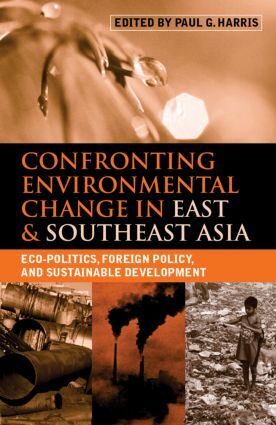 Together, the analysis and case studies in this volume illuminate how environmental change is confronted - or not - in East and Southeast Asia, with a host of important insights for researchers, governments, policy-makers, conservationists and business people dealing with the profound environmental problems facing the region. Paul G. Harris is the Chair Professor of Global and Environmental Studies at the Education University of Hong Kong.